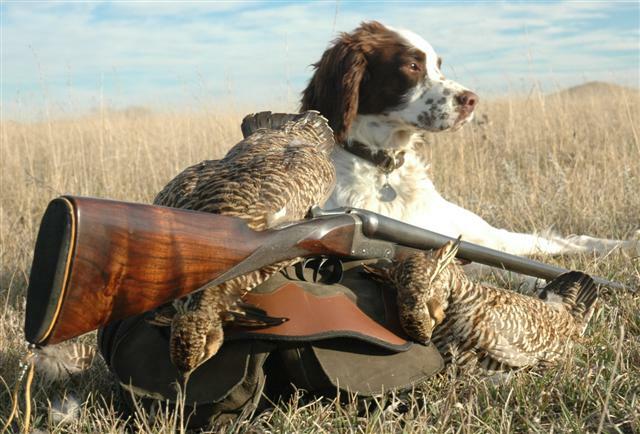 Pointing dogs are the most common choice for hunting prairie grouse. They can simply cover the most ground out there on the vast wide open. Flushing dogs don’t cover as much ground, but this is by no means their fault. Rather, their much slower masters are to blame. However, flushing dog lovers can put themselves in the right place at the right time and deploy proven strategies for excellent results on prairie grouse. The key is understanding these indigenous game birds, their habitat and behaviors. Over the last decade, I have learned a few lessons while working flushing dogs on prairie grouse that even pointing dog enthusiasts might consider useful. While traveling to South Dakota for pheasants, I was unexpectedly taken by the allure of the prairie grouse. Especially appealing is the mature male prairie chicken or “Boomer”. Once numbering in the millions, concentrations of prairie chickens are now found only in isolated pockets. This is the last frontier for these great game birds. In this wild country, the indigenous prairie grouse captures the spirit of the American pioneer West like no other. A hunt for chickens and sharpies is steeped in the history of the breathtaking landscapes they inhabit. Not many places remain where you can bag a limit of prairie chickens several days in a row. I have had the good fortune of hunting at Prairie Grouse Haven with good friend Chance Colombe, a licensed Native American guide from Mission, S.D. Chance has a growing list of honey holes on the Rosebud Indian Reservation and has narrowed his efforts to locating concentrations of prairie chickens. This is “tribal ground” where prairie chickens and sharptail grouse coexist in strong numbers. A Lakota tribal guide is required when hunting the Rosebud. My flushing dog and I would rather hunt prairie grouse than the thousands of wild pheasants there. The allure of the prairie grouse is realized in the mystique of the Native American countryside and the challenge they present, especially with a flushing dog. Their habitat is vast and very different from that of their more popular imported neighbors. Hunting them with a flushing dog requires deployment of some very different strategies. Prairie chickens prefer fairly flat country in native grass near crops. Sunflower is their favorite; corn and soybeans next. Sharptail grouse like grasslands with rolling terrain. Both are challenging targets, especially the mature boomer, considered by many to be a trophy bird. Given their limited numbers and the level of difficulty in bringing a big boomer to bag, this western game bird is a frequent flier on many bucket lists. On the Rosebud, prairie chickens are thriving, and as a bonus there are equal numbers of sharpies. Telling them apart in flight is an acquired skill. Chickens have small fanned tails and horizontal barred chest feathers. Sharpies have a mostly white underside and a pointed tail. Chickens have bare yellow ankles and sharpies have white feathers down to their toes. They both chuckle like they are laughing at you when they flush. grouse frequently provide the opportunity for a double. Last season, two out of every three hunters at Prairie Grouse Haven scored doubles. The season prior, my friend Ross Starner scored four grouse doubles in four days of hunting and one of them contained a sharpie and a chicken! October is my favorite month to be there. Wild roosters are often taken in the grass while grouse hunting. Snipe also migrate through this game bird Mecca. Around mid-morning, chickens settle down and loaf in native grass, rendering them vulnerable. Prairie grouse are more predicable under a normal weather pattern – sunny and breezy. Any precipitation makes them unpredictable, especially chickens. From late October on, the cold weather has already forced the two grouse species into larger coveys. November is the best time to collect a mountable boomer as their Pena’ feathers are fully developed. Thes e are the neck feathers that pop up behind their heads during their mating dance. Interestingly, prairie chickens and sharptail grouse do mix together here. Not on the same spring Lek, mind you, but when the cold weather moves in, they covey up for warmth and protection from predators. Habitat is critical finding grouse out on the vast expanse of the prairie. Look for native grass with nearby croplands. This will be a paradigm shift for pheasant hunters who may lean toward thicker cover in low lying areas. What looks like prime pheasant cover is not where you will find prairie grouse. The best habitat is pristine grass that looks like it did when Native Americans hunted buffalo there. Grouse are not likely to be found in areas where cattle have overgrazed the grass, yet I’ve seen them eating right out of a cattle feeder. They also eat grasshoppers and crickets. The soft green secondary shoots are preferred for loafing. Also, once the big coveys have formed later in the season, mature boomers like to satellite nearby in small bachelor groups, loafing some distance from the covey. I have bagged numerous boomers loafing with other boomers and up to a 1,000 yards from the main covey. One of my most memorable is this double boomer over Mac! A good strategy is to cover a large circle around where the covey flushed, using the topography and wind to your advantage. At first glance the prairie may appear nondescript, but out there it undulates into hidden pockets aching for exploration with small havens that keep prairie grouse comfortably out of the perpetual wind. A sharpie and/or a chicken in the bag taken with any dog is an accomplishment; a mature boomer is a trophy. A double boomer or even a limit of boomers is the ultimate. You need only to step out onto the wild prairie, chase these amazing game birds and take a good look around to realize it. At Prairie Grouse Haven there is a comfortable lodge right on the banks of the Keya Paha River, located in south central South Dakota just a short drive from Winner. Each hunter has their own private room and dogs are allowed inside. The food is country gourmet featuring one of the best bakers in the Dakotas. Field lunches often contain sandwiches made with homemade bread. I happen to be a desert guy and believe you won’t find a better pie anywhere. This hunt is defined as much by the pristine Native American landscape as it is a pleasure to walk. Many of the areas we hunt on the Rosebud have never seen a plow. Veteran upland hunters looking for easier walking and a new challenge need look no further. A bonus with hunting in native grass is that you can actually see every move your gun dog makes while performing for you. Your dog’s feet, nose and tender tummy will also notice the difference between hunting on the prairie compared to thicker, more punishing pheasant cover. Both gun dog and hunter are able cover more ground while out walking the prairie. While there is no doubt that a pointing dog can make hunting for prairie grouse easier, any upland hunter, no matter their dog of choice, can benefit from the lessons learned while hunting prairie chickens and sharptail grouse with flushing dogs. For more information on Prairie Grouse Haven. Contact Scott Winston at scott.winston4@hotmail.com or call 303-450-5013 or 303-250-0302.